Posted by Amifur on February 05, 2019 . 0 Comments. Gone are the days when only women could wear clothes and accessories that would rival a peacock for gorgeous looks. Now men can be the true peacocks since accessorizing is accepted and even expected in the current fashion scenario. In fact a man who does not wear any accessory may look like a bare plucked chicken. It is possible to go overboard which is not advisable unless it is for gold. In the fashion context, you can go overboard provided it is fur accessories for men. Just pick the right ones from Amifur. Apart from the usual men’s fur hats and fur coats you have the option of picking men’s fur accessories like real fur neck warmers and real fur collars from Online Fur Store. Each has a purpose and has tons of style too. If you look around, men everywhere are sporting beards and moustaches supposedly because it makes them look macho and maybe women like it. True or not, a bit of hair, whether it is yours or from a sable, mink or raccoon, can add to the hirsute look and appeal. Just look a real fur neck warmer carelessly around your neck. You stay warm. Importantly you look stylish. For a more opulent look, pick a scarf in genuine fur for men. It has a generous spread and you can look and twist it in different ways. Another accessory in fur for men that you can give serious thought to is the fur headband in mink, sable, fox fur or beaver. It shows serious intent of style and yet it is not that obtrusive. If it gets really cold there is no reason to push your hands into your pockets. Instead buy a couple of hand muffs in raccoon or fox fur from Amifur. You will draw attention. Consider buying a couple of real fur collars for winter. Your neck remains cozily warm and so does your chest. That you project flair is a just a side effect and a positive one at that. That is terribly expensive you think and put off the thought of buying fur and real fur at that. 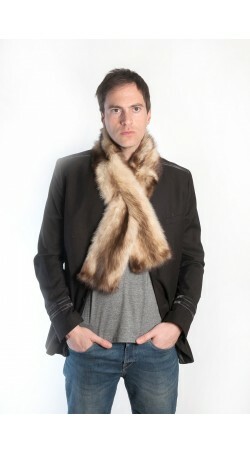 Best Online store offers genuine fur accessories for men, made from supreme quality fur but at down to earth prices. The simple reason why authentic fur is so affordably priced is the appliqué technique of putting together remainders artfully to create an impression of a single piece. Genuine fur looks and feels different, luxurious and pricey unlike faux fur. Each piece of collar, neck warmer, headband and scarf is unique because each is handcrafted with loving care in Italy. Genuine fur is lighter in weight, keeps you warm and lasts for years with proper care. Fur store’s rock bottom prices for the real stuff mean you can buy a half dozen of these accessories and wear them with pride to alter looks each time you mix and match. If your lady wears fur why should you wear only threads?